» The Feathered Friends Flicker Sleeping Bags Review: Is This the Bag for You? The Feathered Friends Flicker Sleeping Bags Review: Is This the Bag for You? Feathered Friends is a smaller company that has been around since the 1970s. It started when husband and wife team, Peter and Carol Hickner, began creating apparel and outdoor gear in the comfort of their home basement. What began as a hobby turned into a true business and Feathered Friends is now one of the best outdoor companies to purchase down sleeping bags and other sleeping systems and gear from. Feathered Friends makes down bedding, down jackets, footwear and more, but it’s their incredible sleeping bags that often draws new customers to them. Though synthetic insulations seem to have taken over the industry few will argue that the comfort and warmth of real goose down isn’t superior. Though there are some concerns with using real down, such as cost vs value and finding a company that uses humanely-sourced down, but Feathered Friends puts these worries to rest. One of their more recent additions to their sleeping bag line is the Flicker series – a group of down-insulated, ultralight (UL) sleeping bags available in a range of sizing and warmth options. Feathered Friends are pros when it comes to designing down sleeping bags so you know the Flicker series is going to impress. Here is a rundown of all the basics you need to know about buying options and design. With the details out of the way, here are some reasons why you might want a Flicker bag of your own. There are four major advantages to buying a Flicker bag. 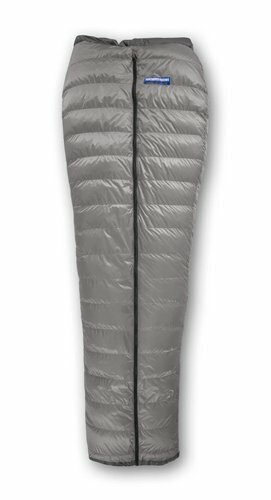 A sleeping bag should be easy to use, comfortable, warm and reliable. The Flicker bags all receive high marks for how nicely they are designed. The full zip center makes getting in and out of this bag a breeze, not to mention the center alignment is easier compared to left- or right-only zippers. The zipper is inverted, with the teeth facing opposite of normal bags. The zipper also has a draft tube to block out cold air. The bag traps in heat and blocks out cold perfectly thanks to a snug footbox drawcord and dual drawcords in the draft collar. The bag has a continuous baffle quilted design so you can physically more the down to where you need it, which makes fixing a cold spot easy. The DWR coating on either shell material keeps out any moisture, while the down natural keeps warmth and loft even if it does get wet. You may have noticed that the Flicker bags all have centered zippers which seems unusual compared to the number of bags with side zippers. This is because the Flickers sleeping bags can all be completely unzipped and used flat as a quilt. 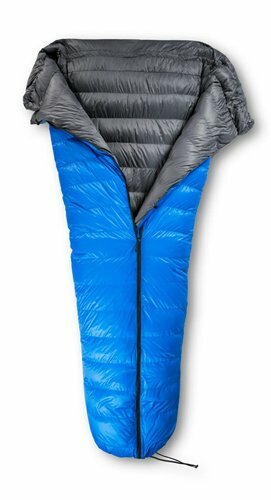 Few sleeping bags have this type of versatility. Being able to use it as a quilt really makes the Flickers user-friendly. The times when you’d like to sit up and relax but still stay warm is made much easier with this design compared to others. There are also tabs so you can use it as an underquilt for hammocks. Despite the ability to use it as a quilt, when zipped up the Flickers are still mummy-shaped and hug the body enough to keep out drafts. Customers have noticed that the Flicker bags are surprisingly warm compared to other sleeping bags, even those with the same amount of fill. The impressive loft of Flicker bags really traps body heat without causing a clammy or humid feeling. One issue that causes many to steer clear of down is the surprising number of companies that don’t use humanely sourced down. As animal rights activists have brought to light how bad the down industry can be, even more people are conscious about down as well as other animal products. Feathered Friends is a company that really does care and uses down that is Responsible Down Standard (RDS) certified. Every part of the down sourcing process is overseen by RDS and held to extremely high standards when it comes to the treatment of the geese. If you didn’t want to try down before because of concerns for animal welfare, you can rest assured that any bag from Feathered Friends is a safe option. Another factor that often makes people balk at down sleeping bags is that they assume the are hard to care for. This isn’t true when it comes to well-made one. The Flicker bags are all very easy to take care of and Feathered Friends make it clear how to clean them. First off, any of the Flicker sleeping bags can be sent back to Feathered Friends for cleaning. This is an excellent option, though it is possible to self-wash if you carefully follow their instructions. The Flicker bags will need some maintenance when it comes to reviving the waterproof coating. Occasionally just washing and drying the bag on medium heat will do this, but otherwise you may need to respray it with a DWR product. There is really only one downside to the Flicker series. The only negative thing about the Flickers are that they are priced high compared to synthetic down bags. Even at the lowest price of $319 the Flickers are still fairly expensive for those that are used to buying synthetic filled bags that can be found for well under $200. 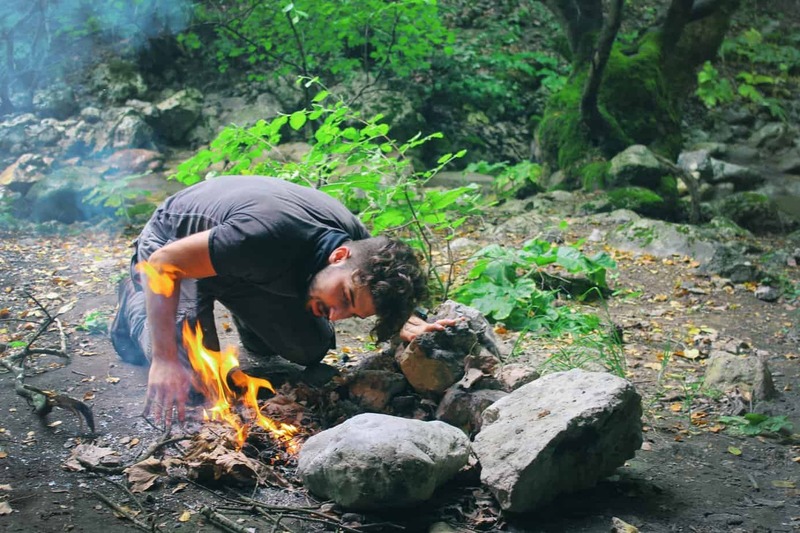 However, with that being said, the Flickers are actually very well priced well compared to other down sleeping bags, either running less expensive or fairly close to the same cost. Overall there is little wrong that can be found in the Flicker sleeping bags. These are just high-quality bags that are made to last and created with superior materials. While the Flicker bags are particularly appealing to hikers and backpackers, due to the UL design, anyone will enjoy using these bags and appreciated the compactness. They are cozy, comfortable, very warm and keep you safe from wet conditions. If you’re in the market for a new UL sleeping bag there are plenty of reasons to check out one of the Flickers first. It is an excellent choice for down sleeping bag fans or those first-time customers that have never experienced the warmth and comfort of a down bag.